The lessons waiting to be learned in a garden are infinite—all that is required is a curious mind and access to the Internet. On Saturday during our month-end cleanup, one of our members was upset because another was cleaning out Goldenrod sprigs from a bed that is destined to become an okra patch. The seedlings were taken and planted at the edge of the riparian area that borders the garden. Goldenrod (Solidago virgaurea) is an herbaceous plant with attractive bright yellow flowers in late summer. This herb was valued by Native American tribes and other cultures in herbal medicine, and for the yellow dye extracted from its flowers. While most would agree there is little place in a vegetable garden bed for goldenrod due to the plant’s invasive tendency, few realize there is a place for them in the garden. I didn’t fully understand myself until I did a little research on the topic. If we were to ask just about anyone on the street what they know about goldenrod, most would say that it’s a plant that makes people sneeze and stirs up allergies. However, that’s not true. It’s not goldenrod, but ragweed that stirs up the allergies. Ragweed and goldenrod bloom at about the same time—late summer, early fall. Goldenrod produces masses of bright golden flowers on single-stemmed plants, and has relatively large, heavy pollen grains that are carried off by bees, butterflies, and other pollinators. Ragweed bares greenish yellow flowers in small heads producing copious amounts of pollen, carried by the wind rather than insects for pollination. Ragweed flowers are not showy. Goldenrod contains numerous medicinally beneficial compounds with antioxidants, anti-inflammatory effects and is often used as an ingredient in herbal tea. Because goldenrod is a good source of the acidic chemical compound tannin, it was used in the process of making leather, known as tanning. The flowers also make an excellent natural yellow dye for cotton or wool. To make the dye, cook the flowers in simmering hot water for about one hour and strain. Other uses for this plant include floral arrangements’ and wine making. The leaves and flowering tops of goldenrod are valued in some cultures for the preparation of ointments, tinctures and powders. Goldenrod is used as a traditional approach to treat diabetes, gout, and arthritis and to support urinary tract health. In Chinese traditional medicine the seeds are used to relieve the stomach and intestines of gas associated with nervous tension: as an anticoagulant and for the treatment of cholera. Medicinal formulas made from the plant are used internally for kidney, bladder stones, urinary infections, and whooping cough; powdered root was taken for dysentery. In Middle Eastern cultures goldenrod was recommended to treat tumors and in homeopathic medicine the herb is suggested for gout. Goldenrod is used as a traditional approach to treat diabetes and arthritis and to support urinary tract health. The plant has some nutritional value as its root and rhizome contain inulin, a carbohydrate that as a prebiotic can stimulate the growth of healthy bacteria in the stomach and promote colon health. Goldenrod tea may be good for cardiovascular health. En vivo studies on lab rats found that aqueous extracts of goldenrod reduced blood pressure. Glycosides in the herb were found to have anti-fungal properties, specifically against Candida and Cryptococcus. DISCLAIMER: This article is not to be taken as medical advice. However I personally will go out and buy some goldenrod tea today—just to see what it tastes like. As far as having goldenrod in the garden, I vote no because of its invasive nature. 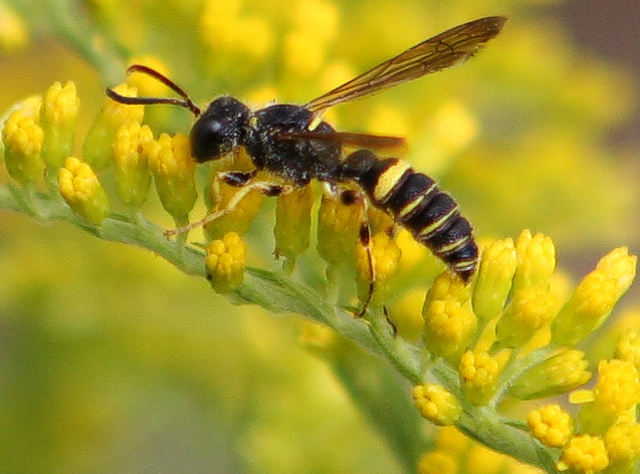 Because of its beautiful showy flowers, Goldenrod attracts not only pollinators, but bad bugs as well. I think that it's place as a native plant is in and at the edge of the riparian area that borders the Garland Community Garden. I had previously thought it might be ok to plant in the Medicine Wheel but unless a vigorous effort is made to keep its invasive nature in check, I vote "NO." Perhaps the entrance to Peach Blossom Land? 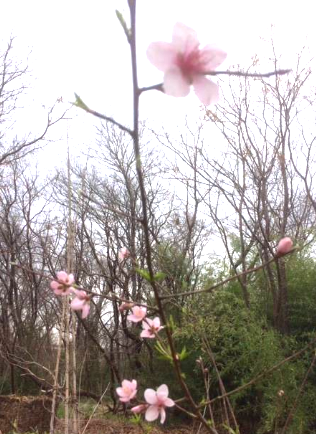 Peach blossoms in the Garland Community Garden contrast with their promise of hope against the backdrop of the winter barren riparian area--home to many. The Peach Blossom Land is a tale told by Tao Yuanming in 421 about a utopia where the inhabitants lead an ideal existence in harmony with nature, unaware of the outside world. Another title for this story might have been “Wishful Thinking” as it was written during a time of political instability and national disunity in China. A fisherman happened upon this place by chance. The village was located in a forest made up entirely of blossoming peach trees—even the ground was covered solid with the blossoms. He spent a week or two there and then marked his route as he left. The fisherman told others of the place and gave them directions, but no one could ever find it. What a Great Day in the Garden! 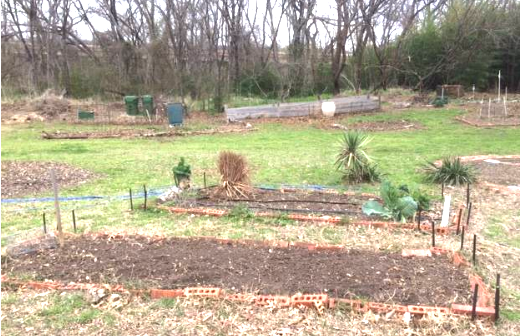 Loving Garland Green, stewards of the Garland Community Garden, work in the garden located at 4022 Naaman School Road throughout the month but the last Saturday of every month is reserved for our end-of the month work session. Yesterday it was time for our February end-of-the month cleanup. We had an absolutely great workday. The students from North Garland High School Environmental Club joined in to help Loving Garland Green members prepare the garden for spring. People were working in the garden from 10 AM to 3PM. STUDENTS GARDEN PROJECT IN PARTNERSHIP WITH LOVING GARLAND GREEN MOVED FORWARD YESTERDAY WITH THE SELECTION OF TWO BEDS. 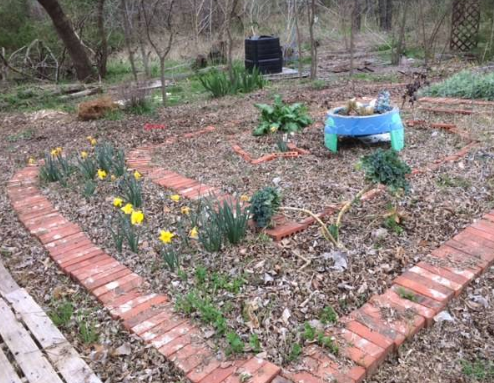 The North Garland High School Environmental Club will take over stewardship of two beds down at the garden. These beds are each approximately 4 feet x 13 feet--about 105 square feet total. This is just the right size for duplicating a Rosalind Creasy gardening experiment that she undertook in 2009. NOTE: For those who may not know, Rosalind Creasy (Author of The Complete Book of Edible Landscaping) is a gardener from the Santa Barbara area who grew veggies in a 100 square foot plot with the purpose to see how much a family could grow in a small space. In that small area and over an approximate 6 month time period, she raised over $750 worth of food. Members of Loving Garland Green will assist the students in preparing the soil for planting; selecting the plants; and in setting up a record keeping system. March April May will be the designated months for the student stewardship. Loving Garland Green members will manage the plot over the summer for June, July and August. Then September through the first week of November, the students will resume stewardship. The goal of this project will be to see how much food (both in poundage amount as well as current market value it's possible for a family to grow in an urban setting in Garland. In addition to the two beds, we will also add two large pots for growing sweet potatoes. It will be interesting to see what our Garland experiment will yield. I'm predicting more produce and a higher market value. I'll be sure to keep you posted on the progress. for this Loving Garland Green and North Garland High School Environmental Club joint project. The peach tree in Cheryl Andres' plot has lots of beautiful blooms as you can see in the lead photograph for this article. As far as it being the entrance to Peach Blossom Land, you'll have to come see for yourself. Cheryl is a Loving Garland Green member who is especially interested in preserving native plants and heirloom vegetables. This is a special heirloom peach that isn't even sold any more. The apricot and peach tree donated by Gene and Margie a couple of years ago and planted by me are also all covered in blooms. Who knows, perhaps we will get some fruit from them next year. Yesterday Anita planted a fig that we will keep pruned back to a large bush size. It's a miracle this thing has survived as I've had it in a pot for about three years. Donna Baird, our liaison from the Garland Multicultural Commission, was also there yesterday helping us clean up the garden. Donna is bringing a plant for the multicultural garden that is grown by her mother who hails from Taiwan. It is a type of spinach. I look forward to seeing it. I'm wondering if it might be what we call "Malabar Spinach" (Basella alba an edible perennial that we've grown elsewhere in the garden). THANKS TO ALL OF YOU WHO PARTICIPATED IN OUR END OF MONTH WORKDAY FOR FEBRUARY! You help make our great garden the success it is for our community. Part of acquiring plants for the upcoming Loving Garland Green plant sale involves not only planting and growing seeds, but also taking cuttings from shrubs and perennials. Yesterday, during a walk in the Garland Community Garden, I noticed that some Artemisia donated by a Master Gardener friend a few years ago had spread. I dug up a few clumps and they are now growing in pots on my front porch. If they survive they will be for sale at the garden. 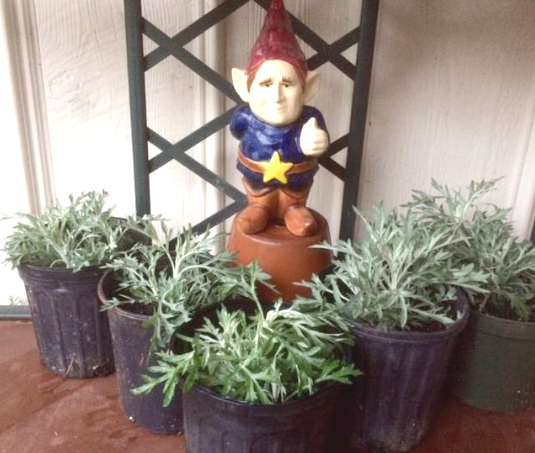 Artemisia for most gardeners is a low-growing shrub that reaches about a foot in height. It adds color and dimension to a flowerbed. Artemisia plants waiting for Loving Garland Green's plant sale. Not only is Artemisia a pretty addition to your garden, it’s also a great conversation piece that has an interesting history. Artemisia (also known as “wormwood”) has a rich history, as it is the main ingredient used to make absinthe. Absinthe originated in Switzerland in the 18th century and rose in popularity as an alcoholic drink in early 20th century France. Absinthe was especially popular among writers and artists. Because it was associated with the bohemian culture, absinthe was, of course. opposed by social conservatives and prohibitionists. Thujone, a chemical compound that is present in trace amounts in Artemisia was touted as being a dangerously addictive hallucinogen. It garnered the nickname of “la fee verte” or the green fairy and by 1915 absinthe had been banned in most of Europe. However, almost 100 years later, studies show the psychoactive properties of Absinthe to have been greatly exaggerated. Today nearly 200 brands of absinthe are being produced in Europe. Absinthe is even legal in conservative USA. Artemisia is also used for medicinal purpose in many parts of the world. People take Artemisia for cough, stomach and intestinal upset, the common cold, diabetes (said to lower blood sugar), muscle weakness, and for parasitic infections. Plants are interesting and critical to our survival—not only because they supply us with food, but also because plants are the source and basis for all our medicines. For example, Foxgloves, a beautiful flower, are the common name for the Digitalis genus, used in ancient times as a drug, and still used today in some heart medicines. Digitalin, a cardiac glycoside that can be extracted from the plant, can help stead rapid heartbeats and arrhythmias in small doses. The name Foxgloves is likely a distortion of “folk’s gloves”. 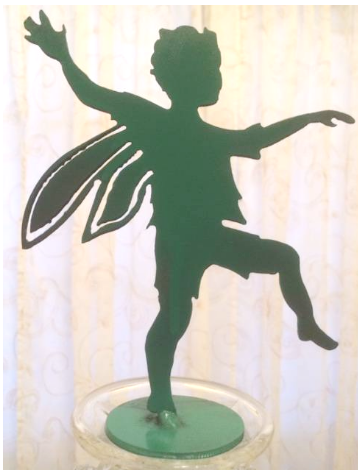 “Good Folk” was the name sometimes used for fairies who were said to live within the flowers. *Absinthe earned the name of Green Fairy because of its green hue and because of its "magical" properties--largely discredited today. 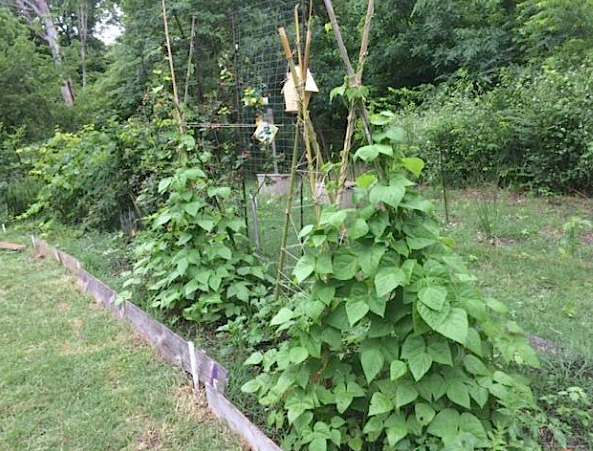 Few vegetables can compete with the dramatic beauty of pole beans growing in the garden--Garland Community Garden September 2016 - Grow a few pole bean plants in your garden and you'll have green beans from June to the first frost. A few weeks ago I was talking to a friend who mentioned that her husband loves those large flat green beans called “Kentucky Wonders”. Some folks call them “Italian Green Beans.” I never knew them by name although after I heard them described, I realized they were the green beans my grannie grew and overcooked to mush when I was a kid growing up out in the wilds of west Texas. You might find the seeds locally here in the DFW area at Rohdes in Garland, but not likely at a big box store. Your best source for finding Kentucky Wonder beans is online at an heirloom seed site—and even at that not all heirloom seed companies carry Kentucky Wonders. This bean was first marketed in 1864 as Texas Pole, then renamed and introduced in 1877 as Kentucky Wonder by James J. H. Gregory & Sons. Vigorous 5-7' plants yield clusters of 7-10" stringless pods. This bean has a great flavor and is an all-time favorite. I’ve designed a pot for growing pole beans in a small space. 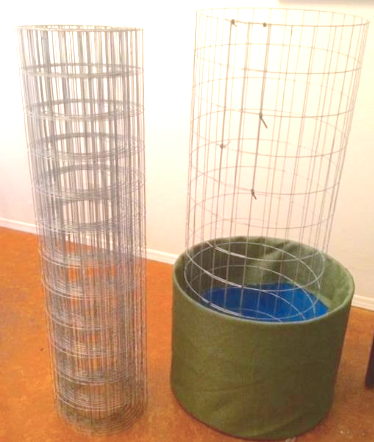 It is one-half of a 55-gallon used food-grade barrel with wire fencing in its center for a trellis. If you go down to the Garland Community Garden, you can see an example in our Bean Patch. For aesthetics I covered my 27-gallon pots in some outdoor environmental cloth. Beans are not heavy feeders of any nutrients. A 3-inch layer of compost may be all that's needed. However, if a test shows that the soil is lacking in phosphorus, add 1 pound of bone meal per 100 square feet for a light feeding of the nutrient—about ¼ cup to the 27-gallon pot. Many folks make the mistake of pouring on Miracle-Gro on their vegetables. Miracle-Gro Water Soluble All Purpose Plant Food has a ratio of 24-8-16, which means that it contains 24 percent nitrogen, 8 percent phosphorus and 16 percent potassium. This is not the fertilizing ratio needed by most vegetables. In fact, if you feed it to tomatoes, you may end up with more leaves than tomatoes and the same goes for beans. EPSOM SALTS: One tablespoon Epsom salts and one gallon of water. Use this to feed your vegetables once a month. Epsom salts is made up of magnesium and sulfate—both of which are vital plant nutrients. Peppers, tomatoes and potatoes especially will appreciate this once a month feeding. COMPOST - Make it yourself and help reduce food waste and replenish the soil in your yard. ? 1. Save your fruit and vegetable scraps, newspapers, grass clippings and other compostable materials. 2. Add a bit of water from time to time, and turn your pile to speed up the composting process. 3. When everything has broken down into a dark, rich soil, spread it in your garden, and enjoy the results. (Put a three-inch layer on top of the soil but keep compost about an inch away from the stems of the plants. Water to keep in place. 1. Find out what the watering requirements are for the plant. Water according to the directions. Check the appearance of the plants, the condition of the soil on the surface and the condition four to five inches down. Plants will often look wilted on a hot afternoon - that's okay. If the plants look wilted in the morning, they need watering. Beans need about one inch of water a week. One square yard requires 4.7 or roughly 5 gal­lons of water to be cov­ered 1 inch deep. Avoid frequent, light watering. Water beans deeply but gently to a depth of four to six inches. Thorough soaking encourages the roots to seek water deep in the soil. With a deep root system, the plants can survive hot, dry weather a lot better. Our plant sale is coming up in about six weeks. It will be held at the Garland Community Garden, of course. You will be able to find heirloom plants at this sale that will be difficult to find elsewhere. For example, Charlie has a lot of heirloom tomato seedlings that include Henderson’s Pink Ponderosa; Tomato Woodle Orange; Tomato Black Beauty; Tomato Napa Rose Blush; and Chadwick Cherry. I have 13 blackberry plants potted and growing—all from my prolific blackberry bushes in my front yard. In addition I have pots of Safflower Dark Orange Red—an annual herb with petals that make an excellent saffron substitute--so excellent that it is often referred to as "poor man's saffron". Saffron is a spice so pricey that it is sold by the gram as an ounce of it can cost several hundred dollars. Pigeon Peas—a beautiful and edible plant will also be offered. We hope to have lots of Swiss Chard and Kale for sale too.